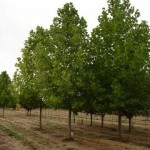 A tall pyramidal to oval, fast growing tree. 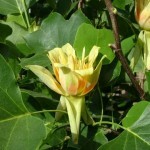 The late spring flowers are greenish yellow with an orange center. Both the leaf shape and flower resemble tulips. The fall color is a bright golden-yellow. Grow in full sun in moist, organically rich, well-drained soil. 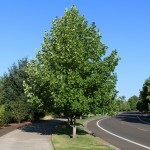 This goes by several common names including tulip poplar and yellow poplar.